The McHale Fusion 3 integrated baler wrapper consists of an 18 roller fixed chamber baler and an integrated vertical wrapping ring. Over the last 10 years, there has been constant pressure on Farmers and Contractors to reduce costs. 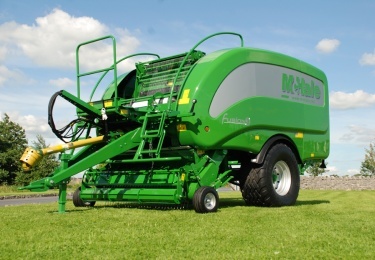 In response to this McHale developed the McHale Fusion 3 integrated baler wrapper, which combines two traditionally separate jobs; namely baling and bale wrapping and integrates them into a single operation, which can be done by one man and one machine. The Fusion 3 is unique in that it has been specifically designed as a high output Integrated Baler Wrapper.